It was bound to be a final for the record books, with either Cilic winning his second Grand Slam title, or Federer winning his eighth Wimbledon title. Going into the match Roger was leading the head to head 6-1, and the last time the two had played had been at Wimbledon 2016. In that quarterfinal match, Federer had to play some of the best tennis of his career to win, barely scraping through in a tough five setter. And the match before had been an even tougher match, with Cilic beating Roger in the semifinal of the 2014 US Open. Cilic played some fantastic tennis, as he has been doing recently as well. In fact, Roger seemed a little weary of Cilic in his post match interview after his semifinal win over Milos Roanic, saying that he hopes that Cilic does not play the way that he did during the 2014 US Open. Going into the match, Cilic was riding a wave of momentum and confidence that we hadn’t seen in the highly experienced Croatian for a while. Not only did he have outstanding results in his per-Wimbledon grass tournament, Queens, where he lost in a tough three setter 4-6, 7-6, 7-6, to the unpredictable and upset causing Feliciano Lopez, but he also had been consistently reaching the semis and quarters of most of the tournaments he had been playing this year, including the French Open. Of course, Cilic was considered the underdog, while Roger was the loved favorite. Even women’s champion Garbine Muguruza wanted Roger as her partner at the ball, rather than Cilic, and going into the match this lack of pressure was meant to help Cilic immensely. However, Cilic was to meet a different, more focused, and resolute Roger at the other side of the net this time around. Roger felt the nerves in the beginning and made some uncharacteristic ground-shot errors due to it but regained his composure and calmed his nerves quickly to start dominating with his serve and ground shots. On Cilic’s 3rd service game in the first set, Federer came up with somewhat flattish and strong backhands to seal the first break of the match and after that Cilic did mount a few efforts to make a comeback but Roger wouldn’t have any of that. The same flattish backhand of Federer was seen yet again at 3-5 on deuce to seal Federer a set point which was immediately followed by a double fault from Cilic to hand the set over to Roger. Except on limited occasions Roger’s serve was never under pressure and Marin’s ultra risky go for broke shots were for most part rendered ineffective by Roger’s defense and Marin’s errors. Federer served well with a 71% first serve percentage and won 84% of those points. Marin on the other hand clocked only 49% on first serve percentage and won 71% of those point. Neither Roger nor Marin served an ace in the first set but had two double-faults each instead. Federer also won 2 of 5 break-point opportunities, had six winners, and only four unforced errors to Marin’s three winners, ten unforced errors, and Marin also missed out on the one break-point opportunity that Federer presented. The most telling aspect of this set was Marin’s high risk flat and go for the lines shots which resulted in 10 unforced errors from his racket and made Federer run from one side to another and cover 53 feet more ground than Marin in the set. However, Federer did whatever it took to win and never seemed out of control in the set. Once Federer won the first set, he relaxed at bit and, as we all know, a relaxed Federer is a dangerous Federer. Many have tried to attribute the 2nd set beat-down by Federer to Cilic’s blistered foot which was duly treated midway through the second set. Apparently Cilic had blisters prior to the start of the match but at no point during the match did his movement appear compromised. Cilic’s tears were not overly abnormal for someone who was utterly frustrated with nothing working out for him. The 2nd set was pretty much a one sided affair with Federer breaking Cilic early for a 3-0 lead and continuing the rampage to win the set 6-1. The stats of this set truly showcases the dominance by Federer and confirms that Roger won this set squarely instead of Cilic losing it or not playing good. Cilic cut his unforced error count to 5 in the 2nd from 10 in the 1st, upped his first serve percentage to 68% from 49% in the first, had 4 winners to federer’s 6, and yet he won only 12 of the 40 points that were played in the second set! The break point was again won by an effective inside-out backhand. Roger and Cilic both finally clocked their first aces in this set and had no double faults. In this set Federer also controlled the center of the court and made Cilic cover more ground too. Cilic tried to mount a valiant comeback in the third and upped his performance level significantly by delivering 67% of his first serves and winning 68% of those points. He won 6 of 7 points at the net and increased his winner count from 4 in the second set to 9 in the third and won 27 of 61 or 44% of total points played as compared to only 30% in the second set. 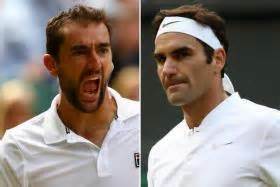 However, Federer did not provide Cilic a single break point opportunity and converted one of the two such opportunities that he Cilic provided him. In his attempt to brak through Roger’s defense shield, Cilic made 8 unforced errors in the third compared to 2 by Federer. Roger fired 5 aces for a total of 11 winners and did not relent or drop his guard even after all the injury treatment and emotional outbursts in the second set. Roger capitalized on one of the two break points and won the third 6-4 and the match 6-3, 6-1, and 6-4 for his eight Wimbledon and nineteenth slam. It was expected that Cilic would use his big serves and great hands at the net to get the advantage in this match. From the very start it was necessary for Cilic to hold his serves, especially since the chances of Roger holding his own serve were extremely high, considering the fact that most of Roger’s service games this tournament have been insanely quick, not lasting more than a minute or so. However, Roger’s aggressive yet solid returns of serve put tremendous pressure on Cilic’s serves and he could not take care of the one thing that we key to him winning his first ever Wimbledon trophy. In the end it was Roger who had 8 aces to Cilic’s 5, 76% first serve percentage to Cilic’s 60% and converted 5 of 10 break point opportunities as compared to none converted out of one oportunity he provided Cilic. Roger had been playing in a way that brought back flashbacks of his 2004 through 2008 game, where he dominated unquestionably. It was his fast paced game that would throw his opponents of their groove, making them scramble from side to side, eventually making them late, and Roger would go on to close with one of his fabulous winners. Throughout this year’s Wimbledon, Roger was able to continue with this aggressive style of play in all of his matches. many forehands he took were half volleys, except in the final he came to the net consistently, and his service was extremely reliable. Federer had also been so quick on his feet, that the entire tour is under the impression that Roger is refusing to age. Although Roger returned to grass court season after a 2 month break, so that he could skip a clay season that he knew he had no chance of winning, he did not seem out of match practice when it came to his grass game. There have, however, been questions regarding his mental toughness. Prior to the final, Roger had been showing signs of nervousness, and had made some silly mistakes at times when he could take a large lead. Federer’s serve may not be the fastest but has always been effective in winning points and its placement has earnd him more aces than many of hard serving players that he has faced. However, throughout this year Federer’s game has been repaing the benefits of a flatter backhand, and aggresive return of serves. In the Wimbledon final too the quality of his backhand and return of serves were the primary factors leading to his sweep. After the last six months and five titles I am now convinced that Roger is perhaps one of those rare few whose backhand is as much a weapon as his forehand. Until Wimbledon 2016 Roger’s backhand was good but not a weapn and almost always gave in under sutained attack of quality players and specially o Nadal. However, Roger’s backhand in 2017 has trasnformed into the most complete and effective weapon with which he can not only flatten it but also slice and execute deceptive drop-shots at will. His backhand may not be as hard as Wawrinka’s but its is more versatile and Federer uses it more appropriately too. While Djokovic, Nadal and Wawrinka use slice as a defensive shot to neutralize rallies, Roger can execute short slices or deceptive drop-shots to draw the opponent forward, chip and charge to rush the net and now he can even flatten that damn thing like no one else. 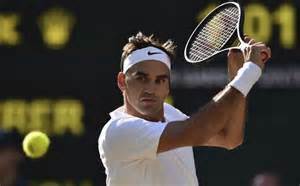 Federer has always been tough to ace and his return of first serve has been one of the best on the tour; however his habit of slicing the second serve return gave his opponents an opportunity to gain control of the point. In 2017 Roger has almost invariably attacked the return of second serves, which in turn has put enough pressure on the server and forced them to go for more on their first service. In tennis mostly the first serve, forehand and backhand, to a smaller degree, can be used to end points at will and therefore can be classified as genuine weapons. Other shots such as the return of serve depend considerably on the quality of serve and are not real weapons as such. Nadal has his forehand, Wawrinka his backhand, and the tree-tops such as Cilic, Raonic, and Karlovic have serves at their service. There are also players such as Djokovic who have dominated the tour with overall excellence and without any point ending weapon. Most players spend a lifetime to develop and hone a single point-ending weapon on the tour, the 2017 version of Federer, however, possess three distinct and deadly weapons in his tennis arsenal. Roger’s forehand was always dreaded on the tour and is still as effective as ever. His first serve is more dangerous than ever and now his backhand has evolved into a point ending weapon. This heavily weaponized version of Federer will be a force to reckon with at the US Open and will certainly be one of the few favorites for the US Open crown this fall. Roger will win the USO this year …. Nicely written and I agree that Federer’s FH, Serve, and now BH are all weapons and the 2017 version of Federer plays better than Djokovic and Nadal ever played.